As a part of ongoing efforts to showcase the success of Green City, Clean Waters over the last five years, we are partnering with the Pennsylvania Horticultural Society to host three nights of special events at the PHS Pop Up Garden at 15th and South Streets. Baxter's Best, a beer brewed by Saint Benjamin Brewing Co. to highlight local water quality and the importance of protecting our rivers, will be on tap. The garden opens to the public each evening at 5 p.m. with a full menu of food and drinks. You might have heard: Philadelphia is celebrating five years of Green City, Clean Waters, a massive green investment in neighborhoods that is now keeping 1.5 billion gallons of polluted water out of our waterways over the course of a typical year of rainfall. Philadelphia Water gathered with the wide range of partners who made beating our five-year targets for greening and pollution reduction possible to mark that achievement at the Fairmount Water Works last week. (See great photos of the event here.) The celebration included speeches from our commissioner, Debra McCarty, and representatives from the Environmental Protection Agency and Pa. Dept. of Environmental Protection. City of Philadelphia Managing Director Michael DiBerardinis—one of Philadelphia’s most dedicated advocates for improved recreation and green spaces—praised the program as a "model for America." The City of Philadelphia announced a major achievement accomplished through the Green City, Clean Waters program at a June 16 celebration marking the five-year anniversary of the Green Stormwater Infrastructure plan’s adoption. Joined by community and business partners, industry experts, U.S. EPA Regional Administrator Shawn Garwin, Pa. DEP Regional Director Cosmo Servidio and City of Philadelphia Managing Director Michael DiBeradinis at the historic Fairmount Water Works, officials from Philadelphia Water unveiled figures showing that the City more than doubled five-year pollution reduction targets established at the start of the Green City, Clean Waters program in June 2011. What we’re celebrating: After five years of Green City, Clean Waters, Philadelphia has enough green infrastructure/improved stormwater management to reduce pollution by over 600 million gallons in 2016. Philadelphia Water will be celebrating a major Green City, Clean Waters achievement—meeting the program’s five-year pollution-reduction targets—at Fishtown’s Lutheran Settlement House (LSH) during the neighborhood’s Sustainability First Friday gathering on June 3 from 5 to 7 p.m.
Members of our Public Engagement team will be at the site’s community garden/farm with a cool model that shows how green stormwater infrastructure works, and students from the after school program will be learning all about water systems and sustainability. First Friday-goers are invited to join in, and we’ll have special Green City, Clean Waters cards that let you show your support for protecting our rivers with green investments in a fun way. All this week, we’ll be taking a look at the broad range of water infrastructure that Philadelphia Water maintains to make sure people, businesses and City departments have constant access to clean, top-quality water. This exploration of our ongoing work is a part of Infrastructure Week (May 16-23), a national movement highlighting the importance of infrastructure and infrastructure funding. This year’s focus: #InfrastructureMatters. Most people know that clean water matters. Recent events have raised awareness about the importance of safe public drinking water, and people across America are thinking about their local water supply today in way that they haven’t in decades. But too often, people don’t realize how valuable water—and the infrastructure needed to protect and deliver it—is until something goes wrong. Infrastructure Week is about recognizing that #InfrastructureMatters so that we take care of what we have and invest in the vast water system that has evolved in Philadelphia over the last 200 years. Philadelphia Water Commissioner Debra A. McCarty joined students and members of the West Philadelphia Coalition for Neighborhood Schools at Henry C. Lea Elementary on May 10 to celebrate five years of Green City, Clean Waters and the completion of a new schoolyard featuring three rain gardens, nearly two dozen new trees, and porous paving and play surfaces. Cliveden Park Celebrates 5 Years of Green City, Clean Waters! Join Philadelphia Water next Saturday, May 14, at Cliveden Park, located at Chew Ave. and E. Johnson Street in Mt. Airy, from 9 a.m. to noon for a special Love Your Park Week event with the Friends of Cliveden and Fairmount Water Works educators. We will be cleaning up this gorgeous public space and showing off Cliveden’s amazing green stormwater infrastructure with a tour exploring how water flows through the park’s unique terraced rain gardens, nourishing the native plants and soaking naturally into the ground instead of overwhelming Mt. Airy’s sewers. 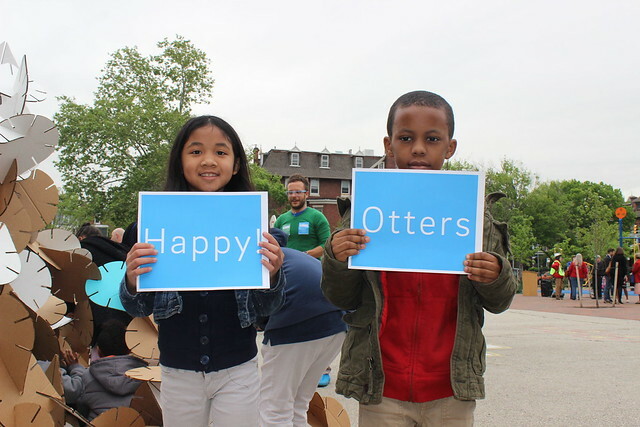 The event is part of our ongoing 5 Down celebrations highlighting the thousands of new green stormwater tools added to Philadelphia neighborhoods through public and private investment during the first five years of the 25-year Green City, Clean Waters program. Working together, the green infrastructure tools now found at hundreds of sites across the city help to keep over 600 million gallons of polluted water out of our rivers and streams each year. Join us at the Science Fest this Weekend and Celebrate 5 Years of Green City, Clean Waters! How Do You Play a Part in the Green City, Clean Waters Plan for the Future? Find Out at Science Fest! This Saturday, Philadelphia Water will be celebrating the fifth year of Philly’s revolutionary 25-year Green City, Clean Waters program at the Franklin Institute Science Carnival, part of this year’s Philadelphia Science Festival. As it happens, the event will be at Penn’s Landing along the banks of the Delaware River, one of the waterways that will benefit the most as Green City, Clean Waters continues to grow over the next 20 years.